Our most popular exhaust components are combined in our complete exhaust systems. These packages combine everything you need for your complete exhaust system at a discounted price. Kooks Custom Headers for the 5.7L VVT 09+Bolt in this performance header system by Kooks and improve your ride's exhaust flow, boosting the performance of your HEMI engine. This Kooks exhaust set is complete from headers to mid pipes and even has an OEM connection for easier installation when keeping your stock cat back system. 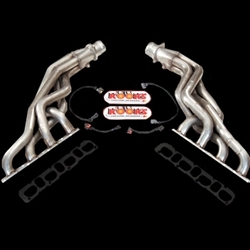 Kooks Custom Headers for the SRT-8Bolt in this performance header system by Kooks and improve your ride's exhaust flow, boosting the performance of your HEMI engine. This Kooks exhaust set is complete from headers to midpipes and even has an OEM connection for easier installation when keeping your stock cat back system.